Ms. Bergin is the Founder and Manager of Northwest Hospital’s Domestic Violence Program (DOVE) in Maryland. Ms. Bergin has a Masters of Public Health and a Masters of Arts degree in art therapy, with 30 years of experience working with abused children and women. Ms. Bergin and the DOVE Program have won a number of awards for their work with abused women. 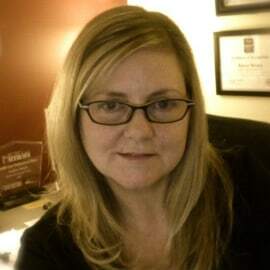 Ms. Bergin is the Founder and Manager of Northwest Hospital’s Domestic Violence (DOVE) Program in Maryland, current chair of Baltimore County’s Domestic Violence Fatality Review Team, and past President and current Coordinator of the Maryland Health Care Coalition Against Domestic Violence. Ms. Bergin has a Masters of Public Health and a Masters of Arts degree in art therapy, with 30 years of experience working with abused children and women. Ms. Bergin has been awarded the 2007 Daily Record’s Health Care Professional Hero’s Award, a 2008 and 2018 Maryland Governor’s Citation and 2013 Maryland Network Against Domestic Violence Medical Award. The DOVE Program received a 2013 National Crime Victims Service Award for innovative programming, in part for its Strangulation Response Project and Emergency Department Physician Protocol developed in 2008.